I work with some brilliant organisations. Organisations run by leaders and managers who understand the value of coaching. They’ve invested time, money and effort into coaching because they understand its value to their people and their organisation. But, often, the people who think they are coaching are not. This can come as a surprise. So the question I am then, quite rightly, asked is: if we aren’t coaching, what are we doing? The answer is often: mentoring. So, what are the differences and do they matter? Coaching is about three main things: listening, clarifying, and asking non-directive questions. However, if you are listening, clarifying and then asking questions in a way that gives advice, expresses a point of view, or leads your “coachee” away from what they are saying and doing to what you think they should be saying and doing, that’s mentoring. And that’s where it suddenly shifts from coaching to mentoring. You are now thinking, “Based on my experience and my views, I can do this to help them.” It manifests itself through directive questions designed to help the “coachee” move towards solving their problem in the way you would solve it for them. Don’t get me wrong, mentoring is great and incredibly positive, used in the right place. For example, if you have a person on your team who is seeking a promotion and, as their senior, they’ve gone to you for help. As their senior you will have more experience, you’ve probably been through the process yourself, and you’ve got all sorts of information and advice to give that person. You are advising and guiding them on how to solve their problem. That’s mentoring. Not coaching. I often advise my clients that it can be unfair to place a coachee with a coach who is in a position of seniority. The coach really wants to give advice but knows they shouldn’t because then they are no longer coaching. How frustrating! To know you can help this person directly but have to hold back. The coach-coachee relationship in organisations works best between peers or between people who can have no impact on each others’ careers now or in the future. It allows the relationship to be truly one where the coach can facilitate the coachee’s problem solving – in whatever way that may be. So, next time you think your people are coaching each other go and listen to them doing it. And if there is a hint of directive questioning in there, it’s not coaching; it’s mentoring. If you want to create a coaching culture or audit your current one, do get in touch. 1. 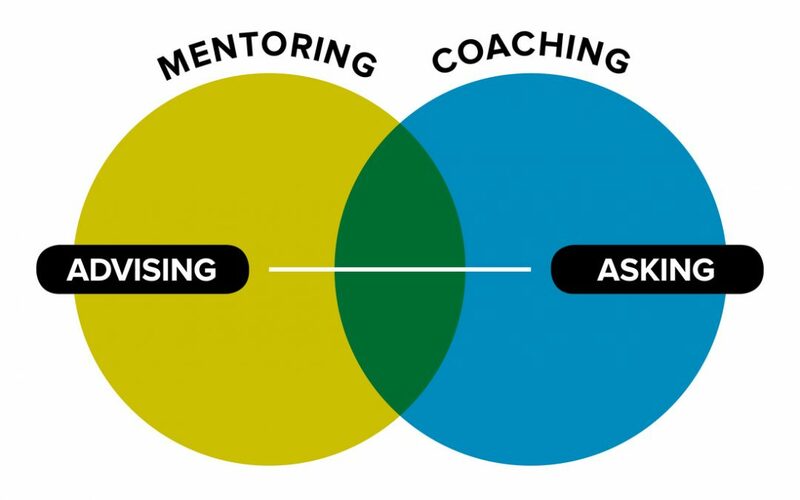 It’s really useful to know the difference between coaching and mentoring. For leaders it’s good to know when one is more appropriate in the situation than the other. 2. Even those higher up the ladder can have a coaching style conversation with a junior. So, for a headteacher developing colleagues, rather than always coming up with the solution, a simple question when the junior is seeking a solution can help the junior think of solutions for themselves, such as ‘what do you think?’ Or ‘do you have any ideas yourself?’ It doesn’t need a formal coaching conversation to take place. 3. This is the most important thing for me. Our approach to coaching has changed over the years, where now I see the whole purpose of a coaching conversation is to have the mind of the coachee settle to help them come up with some fresh thinking. That’s when insights take place, fresh ideas, creativity and resourcefulness take place. Whereas conventional coaching is ‘outcome driven’, the approach I refer to (Inside Out) is very much ‘insight based’. This is where transformation takes place. Thanks Stewart for taking the time to comment – some very good points!